Figure 1. Kicking Up pattern. This article is devoted to the Kicking Up two-line pattern. The Kicking Up pattern (also called the Bullish Kicking) is composed of two marubozu candles appearing as long lines. The first candle of the pattern is a Black Marubozu; the second line is a White Marubozu. The opening of the second line is higher than the previous opening, what forms a price gap. In CandleScanner, we assumed that the pattern can be reversal and continuation. Therefore, the trend prior pattern occurrence is not important -- whenever we deal with a Kicking Up pattern, the white candle means buying demand, predicting price rise. As Shimizu writes, the Bullish Separating Lines pattern can either continue an uptrend or reverse a downtrend. Because the Bullish Separating Lines is quite similar to the Kicking Up, we made the same assumption. The pattern is extremely rare, especially in the liquid markets. It can be seen rather as an exoticism rather than a seriously traded pattern. Figure 2. 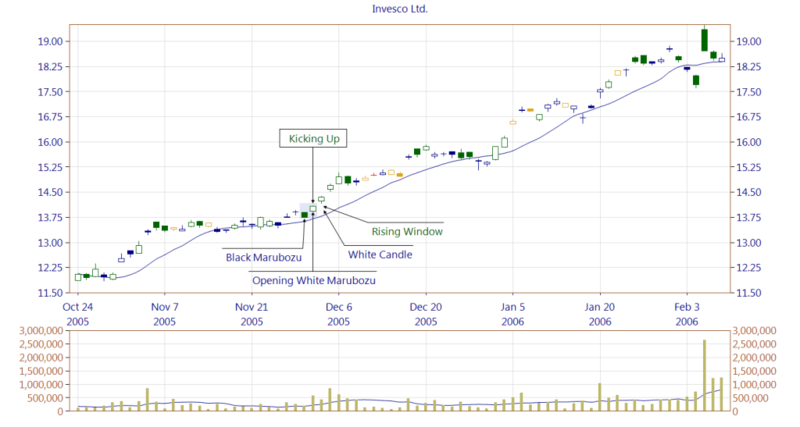 Theoretically the Kicking Up pattern should be composed of a Black Marubozu and a White Marubozu basic candles. The problem is, however, that such configuration is very rare, especially in a liquid market. For the sake of the example, we have relaxed the pattern's requirements slightly by allowing very short shadows to exist. Instead of a White Marubozu we have an Opening White Marubozu. The Kicking Up pattern is confirmed by a White Candle which occurs as the second line of a Rising Window pattern. The example also presents how a chart can be distorted due to the used scale. In order to see the full market context, the chart shows data for a period of 8 months. The price range is between $11.50 and $19.50 that is almost 100%. Candles are "flatten", looking as if they were insignificant squares. CandleScanner software helps to notice which basic candles we deal with, by using so called CandleScanner Color Theme. 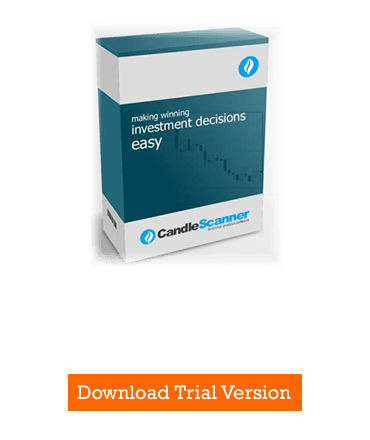 Below you can find some Kicking Up pattern statistics calculated by CandleScanner software. To see more detailed statistics, for other markets and periodicity try our CandleScanner software. Prices start at only $10, and you can see more detailed statistics, for other markets and periodicity. Click here to find out more!